Have a look at Joe Rocket’s sizing chart. We feel this size chart gives an accurate estimate of size for this product. Tall sizes are available and they are approximately 1 1/2” longer in the sleeves and torso. If you normally have to buy tall men’s clothing, then select a tall size in this jacket. The Phoenix 5.0 is the newest version of one of Joe Rocket’s best selling mesh jackets. The entire jacket is a mesh material that allows air to blow right through. The mesh material used in this jacket is about as loose weave (which means maximum air flow) as it gets, so consider this jacket when encountering extreme heat. To help extend the jacket’s comfort range, you get a removable wind/waterproof liner. The liner works great on cool mornings to take the chill off and can be easily removed and stored when it warms up. This liner has a main front zipper of its own so it can also be worn separately as a light jacket (handy when trying to pack light on a trip). 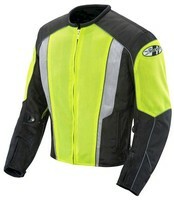 For crash protection the jacket comes with removable CE approved shoulder and elbow armor and a dual density back pad. There is also some exterior padding on the sides of the jacket that offers some extra protection as well as some added styling (the main difference between this jacket and the 4.0 from the ‘07 season). For added nighttime visibility there is a liberal amount of reflective piping on this jacket that runs across the front and back, and down both sleeves. One other neat feature of this new Phoenix model is the interior pocket. The pocket is lined with a very soft material that is made so it will not scratch your eyeglasses or shades. Take the “View Larger Pictures” link above to see some good closeups of this jacket and its features.